Although not every work needs a list of abbreviations, it is often advisable to include such a list at the beginning of monographs and edited collections, even if one is following the SBL Handbook of Style. This allows a reader quickly to discern the meaning of a given abbreviation without consulting another source that may not be readily at hand. This post details some considerations for creating an abbreviations list. An abbreviations list should include all ancient sources; modern journals, dictionaries, lexica, encyclopedias, and series; grammatical abbreviations (e.g., abl. ablative); and technical sigla (e.g., > omits the lemma). One may omit abbreviations of biblical books if the intended reader will likely be familiar with the abbreviations. The final format of the abbreviations page will be determined by the publisher. SBL Press recommends that, unless you are instructed otherwise, format the abbreviations list into two columns separated by a single tab. This will make it easy for the publisher to convert the format of the abbreviations list into the preferred style. ABD Freedman, David Noel, ed. Anchor Bible Dictionary. 6 vols. New York: Doubleday, 1992. * Abbreviations and titles are italicized or roman according to their usage elsewhere. * In attributed ancient works, the ancient author name should precede the title in the second column only. * If the same abbreviation is used for more than one ancient source, include both sources on the same line. * Journals and series include the title only. Do not include information about the publisher. * Encyclopedias, lexica, and similar reference works should include the full bibliographic information in the same form as it would appear in a bibliography, beginning with the last name(s) of the author(s) or editor(s). 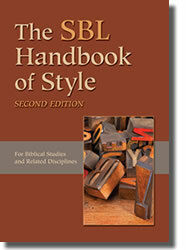 ABD Anchor Bible Dictionary. Edited by David Noel Freedman. 6 vols. New York: Doubleday, 1992. * Tip: Align the second column of the abbreviations list using Word’s built-in ruler rather than inserting spaces or extra tabs. For more information on how to use Word’s built-in ruler to align text, see here. Ignore: hyphens, en dashes, periods, and double and single quotation marks. Greek, Hebrew, and other foreign characters should be placed where they will most benefit the reader. For instance, θ’ (signifying Theodotion’s Greek translation of the Hebrew Bible) can be located immediately after the numbers (e.g., after 4QpNah above) or with the th entries. Additional information about specific abbreviations can be found in the SBLHS §8 and throughout this blog. For abbreviations we do not list, see Siegfried M. Schwertner, Internationales Abkürzungsverzeichnis für Theologie und Grenzgebiete, 3rd ed. (Berlin: de Gruyter, 2014).